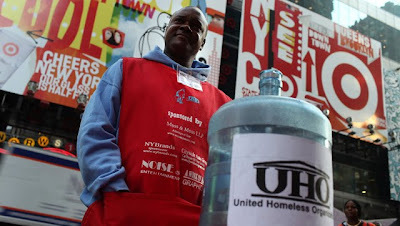 One of my first days on the job at my office on E.42nd Street, back in 2001, one of my co-workers saw me stuff a dollar into the jar of the "volunteer" for the United Homeless Organization that was outside our building every day, next door to Grand Central. "Hey, that's a scam," he confided. "Those guys rent the table from UHO for something like $25 a day. Anything else, they get to keep." Everyday we watched the hundreds of dollars pour into the guy's jug from sympathetic commuters. The same guy, every day. We could often hear his robotic chants from our 16th floor office. "Your spare change will feed somebody tonight. Help to feed the homeless." Today, finally, NY Attorney General Andrew Cuomo called the UHO out as a sham organization. One of New York City's most visible homeless charities is a sham, according to the state's attorney general. Since the late 1980s, tourist-packed areas in midtown Manhattan have been peppered with large plastic jugs set up on card tables to collect money for a group called the United Homeless Organization. People working the tables routinely say the money goes to services like food pantries, shelters and drug treatment centers. In reality, almost all donations wind up being pocketed by the group's staff and founders, Attorney General Andrew Cuomo said in a civil suit filed Monday. "UHO exploits the good intentions of people who thought that their charitable donations were helping to fund services for the homeless," Cuomo said in a written statement. "Instead, their donations go directly to UHO's principals and workers, who abused the organization's tax-exempt status to line their own pockets." If so many people have known for years and years that this was a fraudulent organization, why was Cuomo's action so long in coming? I still see that same guy in front of Grand Central.